Here is my list of the Council’s top ten accomplishments during my year-long term as Council president, a position for which I am grateful to my colleagues for electing me. 10. Convened the Council’s first emergency session to respond to the GOP Congress’ Tax Act, passing legislation to allow County residents to prepay 2018 property taxes in 2017 and maximize their State and Local Tax deductions. 9. Approved funds to support organizations that provide legal assistance to county residents who are in deportation proceedings. Grants have been provided to Kids In Need of Defense, which helps children that have been separated from their families, as well as HIAS and other groups. 8. Funded a revised stormwater infrastructure program that will ensure efficiency and affordability while maximizing environmental benefits. Negotiated a solution to overcome an executive veto. Also approved a ten year update to the County’s Water and Sewer Plan. 7. Supported the County’s bid for Amazon HQ2, including a zoning plan to streamline the process for corporate headquarters to locate in the County. 6. Approved a zoning change for the Agricultural Reserve in the County enabling business owners there to operate wineries, breweries, distilleries and cideries. 5. Adopted a visionary Bicycle Master Plan to guide the future of biking infrastructure in the county; and added funding for a Bethesda protected bike lane loop, in addition to the Silver Spring protected bike loop under construction. 4. Approved a zoning change to support additional wireless infrastructure (4g leading to 5g) in downtown and commercial areas (consideration continues on residential areas). 3. Supported major capital investment in WMATA. Locally funded new pedestrian access entrances for White Flint and Forest Glen Metros. Successfully advocated to expand rush hour service from Grosvenor to Shady Grove; similar expansion on Glenmont side is under study by WMATA. 2. Enacted legislation to increase affordable housing in the County by increasing the minimum percentage of Moderately Priced Housing Units (MPDUs) that are required to be built in new residential developments from 12.5 to 15 percent in high income areas of the county. Modernized the MPDU ordinance generally and established a clear MPDU incentive structure for bonus density. 1. Approved a $5.6 billion Fiscal Year 2019 Operating Budget without raising taxes. The Budget fully funded the Board of Education’s request for Montgomery County Public Schools (MCPS), including an additional $3.3 million for expanded pre-k programs — raising the two year total of early education expansions to over $7 million and creating more than 650 new full day pre-k slots, for a total of about 3,200 children attending publicly funded pre-k programs. The Council also added Excel Beyond the Bell after school programs at two additional Elementary School. Bonus: Did it all in an election year! This week the County Council unanimously passed a zoning measure that creates a clear and reasonable path for farm-based breweries, wineries, cideries, and distilleries to locate and grow here in our agricultural areas. This is a win for farmers, creators, and consumers alike. 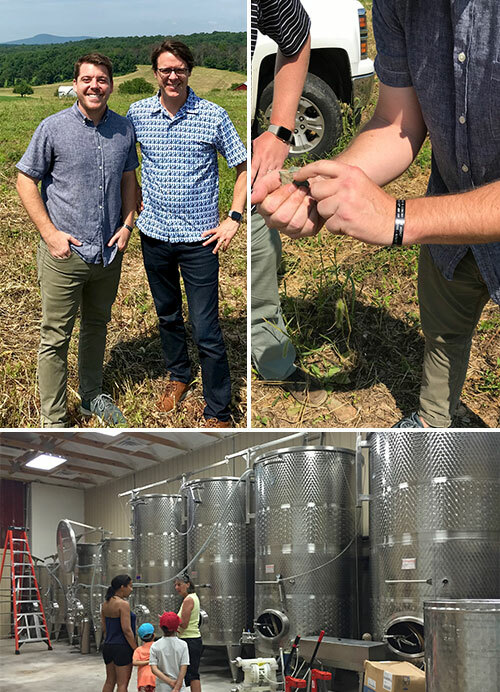 The County already has a growing industry of wineries and breweries, thanks to visionary entrepreneurs and a commitment from County government that has resulted in reduced regulatory barriers and increased incentives. Serious challenges, however, existed in our zoning code for entrepreneurs trying to start and grow a business in our rural and agricultural areas. Tackling these challenges head on, the zoning measure passed this week establishes clear and reasonable zoning rules that incentivize investment and enhance the agricultural heritage of the County. The core of the ordinance is to allow these businesses as accessory to a farm operation. In other words, the primary use of the land or property must be agricultural. The measure also set prudent and balanced requirements for events and local ingredients. For all the details, read the staff report. Making beer, wine, cider, and spirits has historically been agricultural activity— farmers brought not only grain or produce but also beer or whiskey to market. Increasing demand for local ingredients from our craft alcohol producers opens new opportunities for Montgomery County farmers. There is potential for hundreds–or even thousands–of acres of grains, hops, and fruit being grown in the County for our local craft alcohol producers. Allowing this use is helping a new generation to return and thrive as business owners in our agricultural reserve. You can see the creativity and energy these young cultivators and creators are bringing to the job. Having this opportunity makes farming more viable which will reduce pressures to sell for residential development or sell to corporate farming conglomerations. These businesses enhance the quality of life of our residents and make Montgomery County a better place to live. Have you spent a Saturday afternoon at one of our farm breweries or wineries? It is an experience you don’t want to miss. I want to thank Councilmember Craig Rice for co-leading this effort with me as well as all my colleagues for their support. Most of all, I want to thank all the stakeholders and community members for their advocacy and inspiration. There is no doubt that the ordinance I introduced last spring improved considerably as we learned more and incorporated good ideas from all sides. Here’s to a prosperous, vibrant, and sustainable agricultural reserve! Have you had the chance to visit one of Montgomery County’s new wineries or breweries? Thanks to visionary entrepreneurs and a commitment from County government that has resulted in reduced regulatory barriers and increased incentives, a new industry is beginning to thrive here. These small businesses create good middle-income jobs in manufacturing, marketing, and sales. They have helped revitalize urban districts such as Silver Spring, bring life to industrial districts in Rockville, and create destination experiences in our farmland communities such as Poolesville, Laytonsville, Dickerson, and Brookeville. After resolving zoning and regulatory barriers in our commercial areas, the next important step is to establish a reasonable framework in more rural areas for wineries and for farm operations to establish breweries, cideries and distilleries. Making beer, wine, cider, spirits has historically been an accessory agricultural activity— farmers brought not only grain or produce but also beer or whiskey to market. We can return this production if we establish laws to enable it, rather than continuing to support laws that stifle local production and thereby advantage large-scale corporate production. Accordingly, I introduced zoning changes (ZTA 18-03). I thank Craig Rice for joining as co-lead. I appreciate Councilmembers Floreen and Leventhal’s supportive work on the ZTA at the PHED committee and Councilmembers Hucker, Katz, and Navarro for joining as co-sponsors. The ZTA seeks to carefully balance the opportunity to support these businesses with our commitment to preserve the agricultural heritage of the County. The core of the proposal is to allow these businesses as accessory to a farm operation. In other words, the primary use of the land or property must be agricultural, but a brewery can be an accessory business that supports the farm. ZTA 18-03 enjoys wide support from a diverse group of stakeholders, including the Montgomery County Farm Bureau, the Montgomery Agricultural Producers, the Montgomery County Agricultural Advisory Committee, Montgomery County Agricultural Preservation Advisory Board, the Montgomery County Office of Agriculture, the Montgomery County Economic Development Corporation, the Montgomery County Food Council, the Maryland Breweries and Wineries Associations, the Maryland Distillers Guild, and many individual members of the community. The ZTA has been the subject of public hearing and two committee worksessions. It will come before the full Council in September 2018 for final action. I invite you to learn more and consider sending your thoughts to the Council by emailing County.Council@montgomerycountymd.gov. If you would like to read more about some of the new wineries and breweries that are growing roots in our farmland areas, here are some references for Black Ankle, Old Westminster, Rocklands, Waredaca, Brookeville Beer Farm, and Elder Pine. If you have any questions, please don’t hesitate to reach out to my office directly at Councilmember.Riemer@montgomerycountymd.gov or 240.777.7964.